A mortgage broker acts as an intermediary between a borrower and a lender. Their job is to compare the rates of all lending institutions, not only banks, to find the best mortgage for you. Mortgage brokers act as independent agents, whereby they research and communicate with different financial institutions in order to find the cheapest option available. Think of them as your personal loan shopper, going store-to-store finding the best, most affordable option. By working with different institutes and using their various contacts, mortgage brokers will research how and where you can find the best mortgage, with the lowest interest rate. Do you know the difference between a mortgage term and amortization period? Find out here. By assessing people’s current financial situation, mortgage brokers evaluate the borrower’s ability to secure financing and determine an appropriate loan amount. They gather information on the borrower’s current income and decide all the loan details, including where to get the loan, the interest rate, payback terms, down payment and much more. These brokers research and connect with a variety of different financial institutions in order to find the right option for their clients. Why do some people work with a mortgage broker and some don’t? Some people work with mortgage brokers because they simply don’t have the means to find the information themselves. Applying for a mortgage can be a complex and overwhelming process, especially with so many different options available. Having a mortgage broker can make this process simpler, easier, and faster. They will do all the research for you and help you find the best option. This is particularly true if you’re going through this process alone. Moreover, some people work with mortgage brokers because of their bad credit score. If you have a hard time getting a loan to begin with and you don’t qualify with the banks, a mortgage broker can provide you with even more options. They can help you find the money you’re looking for. Wanted to know how much it costs to purchase a house in your city? Click here. To apply for a loan in Canada, follow these steps. Before choosing a mortgage, order a copy of your credit report to ensure there aren’t any errors. You can guarantee that a potential lender will look at your credit report before approving you for a mortgage. Look for a mortgage broker if you’re considering getting one. Keep in mind that all brokers have different connections with different people. So, keep your options open and see where you can find the best deal for you. 1. Which Lender is Best For my Financial Situation? Your mortgage broker will need to assess your finances before they can determine which lender is most suitable for you. All borrowers are different and will, therefore, different lenders will be best suited for some and not for others. Working with the lender that best fits your current financial situation, with the least amount of risk should always be the number one priority of both you and your mortgage broker. You should feel comfortable and confident taking this loan, knowing it’s the right choice for you. 2. What Interest Rate Will I Qualify For? The interest rate that you qualify for will affect your overall cost of borrowing. If you’re able to qualify for a lower rate you’ll end up saving thousands. On the other hand, the higher your rate, the more expensive your loan will be and potentially more difficult to manage. 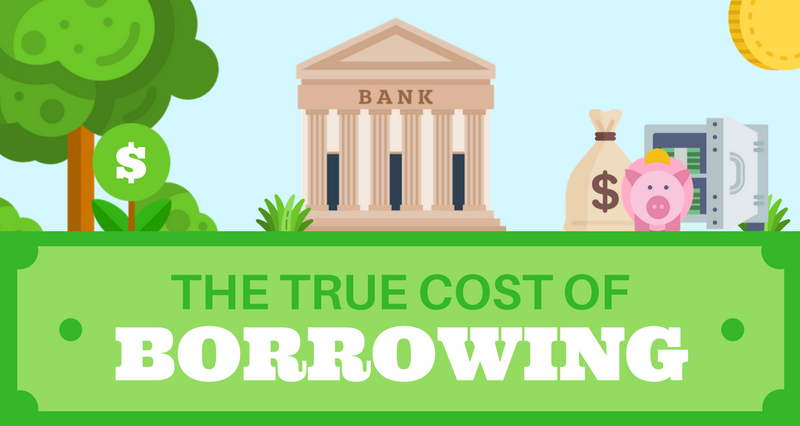 Check out this infographic for more information about the true cost of borrowing. 3. Is There an Origination Fees? Occasionally, lenders will charge an origination fee. Ask your mortgage broker if you’re subject to these fees and if so, how much will it cost you? Also, consider asking if there is any way for the origination fee to be waived. 4. What Are The “Hidden Costs”? While the term “hidden” might be a bit strong, there are in fact many fees associated with applying for and being approved for a mortgage. This is why it’s so important to ask your mortgage broker about every fee you’ll need to pay, this way you can budget accordingly. 5. Can You Provide me With a Loan Estimate? An estimate of all the fees you need to buy during the mortgage approval process is called a loan estimate, which your lender is required to give you. This amount, which includes all costs associated with your loan, will be provided when your application is finished. Make sure to ask about these fees if your mortgage broker doesn’t initiate the conversation as these charges add up quickly. 6. How Large Should my Down Payment be? Always ask your mortgage broker how much your down payment should be. Most first-time house buyers assume the larger the down payment, the better mortgage rate you’ll receive. However, this is completely false, as you can give as little as 5% and still get the same mortgage rate as those who put down 20% or more. Your mortgage broker can provide insight and advice on just how much of a down payment is appropriate for the house you want to buy and the life you want to live. Check out this article to learn how to save for your down payment. 7. Is a Fixed Rate The Best Option For Me? Considering the constant fluctuation of interest rates in the market, it may be advantageous to lock your loan with a fixed interest rate. If you feel like interest rates may increase sometime soon, solidifying your loan with a fixed interest rate is a smart way to keep your interest rate from increasing during your first term. 8. Is There a Penalty Fee For Prepayment? A prepayment penalty is when your lender charges you a fee to pay off your mortgage earlier than originally agreed. The reason that this penalty exists is that when a lender provides a mortgage to someone they are counting on making a specific amount of money off of that loan. If you pay a mortgage back sooner than planned, the borrower doesn’t make as much money from interest and therefore charges a fee. How much will the penalty be? What are the terms of the prepayment? Will I be charged the penalty if I refinanced my mortgage later on? 9. Can You Guarantee That my Closing Will be on Time?